When I was a youngster, I dreamed what I thought was an unattainable dream – of wielding the power over ordinary people’s lives, my decisions condemning them to life or death, my whims allowing families to reunite or mothers to be separated from their children. 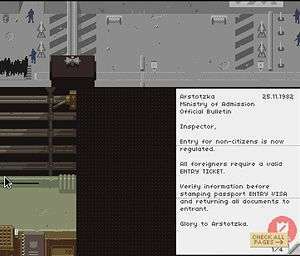 Finally, with ‘Papers, Please‘ my dream is realised. Lucas Pope’s ‘dystopian document thriller’ is, at its heart, a passport-stamping simulation. The mechanics of the game boil down to receiving an immigrant’s papers, checking for discrepancies and then either granting access or using your big red stamp of doom* to send them packing to the country from whence they came. While on paper this sounds about as interesting as, well, actually being an immigration clerk, the game itself is a deeply absorbing, thrilling and even emotional triumph. You arrive for work on day one, having won the Arstotzkan labour lottery, the prize for which is the position of document inspector at the newly-opened border crossing in the town of Grestin, which straddles the border of Arstotzka and Kolechia. Tensions are still high due to the two countries having just concluded a six-year war, and this seemingly-innocuous role places you on the front line of these tensions. Using only the finest 1980s’ technology, it is your job to make sure that no-one crosses the border illegally. As a highly-suspicious (fictional) communist state, you are at first directed to only allow Arstotzkan citizens to cross the border. As each day passes, however, new rules are added – foreigners are permitted next, but soon they must carry approved entry tickets. As the days tick by, rules become more complicated and your eye for detail must be sharper than ever; immigrants will attempt to smuggle weapons and contraband, passports from a certain region will need to be confiscated and, at times, you may have to tranquilise terrorist threats. With so many mechanics being layered upon each other, the game could easily become a confusing mess. Fortunately, the systems through which you perform your duties are intuitive and easy to understand. Each day starts with a bulletin highlighting any new rules or requirements, and later in the game this also showcases wanted criminals who may (or may not) come through your border hut. Generally speaking, each time a new rule is introduced, one of the first few people through the border hut will undoubtedly relate to the new direction on the bulletin, giving you an immediate opportunity to practice and spot what’s required. The tools at your disposal are both intuitive and easy to use – there are stamps which either deny or allow access on a passport, a rule book which contains all of the regulations given to you so far, alongside a world map which provides information on issuing cities and document seals. Upon discovering a problem with documentation, you simply select a large red cross, highlight the relevant rule and interrogate the immigrant – at which point you will hear a variety of amusing and often pathetic excuses. Any single piece of information within any of the papers you are provided with could point to a reason not to allow someone through the border. More obvious reasons such as expired passport dates, pictures not matching and incorrect genders sit alongside more subtle and tough-to-spot problems such as false issuing cities on passports or weights on ID cards not matching with the scales that sit to your left. If you do incorrectly process someone, a dot matrix printout appears (this is 1982, after all) citing you for your error. You’re permitted two errors before your mistakes start costing you five credits apiece – and in the Arstotzkan economy, this is a lot of money indeed. The credits are more than just a simple way of penalising you for your errors. At the end of each day you are paid your salary – five credits per person processed – and from this are deducted rent, food, heat, and any other costs that arise, such as medicine should your family become sick, or a birthday present for your son. Other opportunities to make money will also present themselves as the game progresses. – a border guard will share his bonus with you for detaining suspicious immigrants, or someone attempting to cross the border may offer you a bribe. These all add to your savings (should you balance your wages well enough) and allow you to increase your housing. Starting in your government-provided class-eight dwelling, opportunities soon arise to move up in the world – providing you have the coins to pay for it. If this were all there was to the game, it would probably be a nice little puzzle game that could distract you for a couple of hours. However, what really lifts ‘Papers, Please‘ above the norm is the story that’s weaved throughout your duties. Despite never doing more than performing your duty, a rich story of a paranoid Eastern state emerges through the news bulletins you receive each day and the people that you interact with. Some characters are recurring – the entertaining Jorji is a personal favourite of mine – and each of these adds weight to a growing narrative. At one point you make friends with a border guard who eventually asks a personal favour – the outcome of which, after the decisions I made, had a genuine emotional impact on me. Many of the decisions presented to you come with a moral dilemma – you become torn between duty and conscience. There is even a chance to become part of an anti-government terrorist organisation which leads to real moment of tension as your try to surreptitiously aid their cause – or not. The choice is yours entirely as to what you do. The cherry on the cake of the immersion into the Arstotzkan border patrol is the presentation of the game. The soundtrack features oppressive communist-style strains, and the ‘voice acting’ amounts to nothing more than garbled 16-bit sounds which do a surprisingly good job of denoting an eastern European style dialogue. The sounds heard when you make tannoy announcements are particularly authoritative and pleasing to the ear. 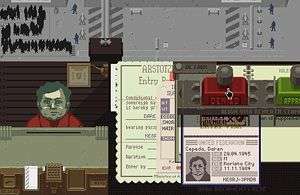 Graphically, ‘Papers, Please‘ is presented in a charming 16-bit style – character faces bear an uncanny resemblance to the kind of thing seen in the Mega Drive version of Micro Machines. Each character’s face is technically unique although, after a little play, you do start to notice that a lot of people look very similar to each other, which can lead to an uncanny feeling of admitting triplets through your borders on some days. In addition to the story, there are ‘endless’ modes of play available to unlock by remaining in your job for the duration. This adds new pressures to the job – in one mode, a single citation can lead to you losing your job and therefore failing the game. This adds a welcome layer of replayability to the title as, although it is interesting to go back and change your decisions in the story mode to see what happens, sitting through the same conversations with people over and over again can become a little wearing. Endless mode taps in to the strange satisfaction of the main meat of the document-stamping game, lending a few more hours of blissful decision making. 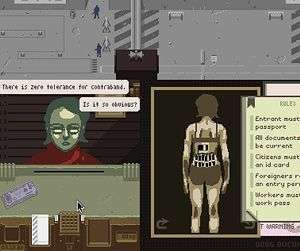 ‘Papers, Please‘ takes an interesting concept and builds an absorbing and compelling world around it. Its retro presentation is extremely charming and fitting for the subject matter and, while the actual process of playing the game can become repetitive at times, the narrative and emotional investment is more than enough to keep you playing through to completion – especially when you achieve one of the ‘failure’ endings and go back to rectify your mistakes. Comrade, please report to your station, and glory to Arstotza. *not what they’re actually called. Sorry. Document stamping is oddly relaxing. The 'ker-chunk' sound of the stamp is inexplicably staisfying. Despite being sceptical about this game after hearing the inital premise, "Papers, Please" quickly won me over with its charming aesthetic and engaging story. The gameplay mechanics are challenging and, at times, do become a little convoluted with the amount of rules to take in to consideration, but this never put me off wanting to see what would happen on the next day. At just £6.99 and with extremely modest requirements to run, this game comes highly recommended.